[The period covered by Arts: Search will be 1850 [all published]. Available soon. 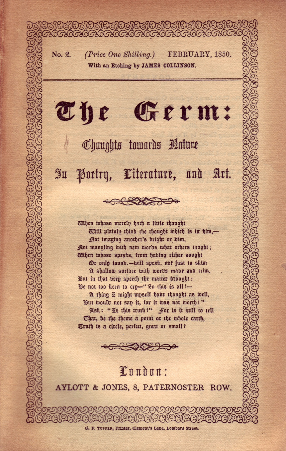 The Germ was a short-lived journal produced by the Pre-Raphaelite Brotherhood and edited by William Michael Rossetti. Four issues were published - January, February, March and May 1850. The title changed to Art and Poetry in March 1850. Contains etchings by Ford Madox Brown, William Holman Hunt, Walter Howell. Deverell, and James Collinson; and poetry and essays by Dante Gabriel Rossetti, Thomas Woolner, Coventy Patmore, William Michael Rossetti, and others.